What Is the Six Thinking Hats Tool? 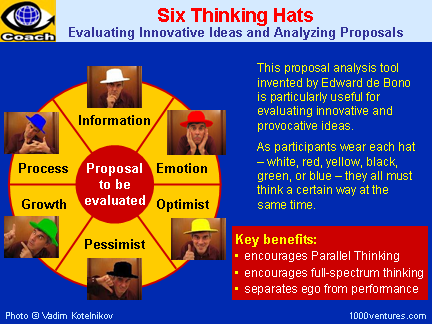 The Six Thinking Hats proposal analysis tool invented by Edward de Bono is particularly useful for evaluating innovative and provocative ideas. While most of our thinking is adversarial, the six thinking hats technique overcomes these difficulties by forcing everyone to think in parallel. As participants wear each hat – white, red, yellow, black, green, or blue – they all must think a certain way at the same time. Many organizations all over the world use the Six Thinking Hats tool. Among its active users are British Airways, DuPont, Federal Express, IBM, Nippon Telephone and Telegraph, Pepsico, Polaroid, and Prudential Insurance. The White Hat is the information hat. This covers facts, figures, information needs and gaps. People can ask for more information or data to help analyze the proposal. The Red Hat represents emotions. This covers intuition, feelings and emotions. People have to say how this proposal makes them feel emotionally: scared, threatened, excited, energized, etc. It is important to get the feelings expressed, as they can be hidden reasons why people would oppose or support a proposal. The Yellow Hat is the hat of optimism. This is the logical positive: why something will work and why it will offer benefits. Everyone in turn has to say what is good about the proposal. Even if you think the idea stinks you have to find some good points and redeeming qualities about it. The Black Hat is the pessimism hat. This is the hat of judgment and caution. Everyone has to find fault with the idea. Even if it was your idea and you are very proud of it you have to point out some drawbacks and disadvantages. The Green Hat is the hat of growth and possibilities. This is the hat of creativity, alternatives, proposals, what is interesting, provocations and changes. Everyone has to suggest ways in which the idea could be adapted or improved to make it work better. The Blue Hat is the process hat. This is the overview or process control hat. It looks not at the subject itself but at the 'thinking' about the subject. It is used to check if the process is working well. When you wear it, you discuss whether you are using the method in the most effective way. Practical and uniquely positive approach to making decisions and exploring new ideas. To gain an even broader picture, once you complete the SWOT Analysis, run through it again as though you are one of your competitors. The "Six Thinking Hats" might need to be slightly modified if it is to be used in different cultural environment. For instance, in China, "wearing a green hat" means that your spouse is cheating on you. So it may be difficult for participants to think about growth and possibilities when they put a green hat on. The hat of "growth-and-possibilities" might need to have a different color in China.